Home > What is Preterism? Preterism, Preterist Theology and the Preterist View of Eschatology answers “Christianity’s Achilles heel.” In Matthew 24, Matthew 16:28, Matthew 10:23, Mark 8:38-9:1, Mark 14:61-62, and John 21:22 Jesus promises to return within His generation, specifically within the lifetime of the Apostle John and the High Priest Caiaphas. Preterism, preterist theology or the preterist view of eschatology is the Christian belief that Jesus has already returned and that most, if not all, end time prophecies have been fulfilled primarily or exclusively in the first century. Preterism, Preterist Interpretation, and the Preterist View of Eschatology: An Angelic Army in the Clouds was seen at the Start of the Jewish War in A.D. 66 EXACTLY as the Second Coming is Depicted in Revelation 19:11-15 and Many other Verses. For a detailed explanation of how this event LITERALLY fulfills Biblical descriptions of the initial or “coming” aspect of the Parousia, a Greek term meaning coming often with an extended presence, see Jesus, the Son of Man, was LITERALLY Seen in the Clouds in A.D. 66 and Historical Evidence that Jesus was LITERALLY SEEN in the Clouds in the First Century. 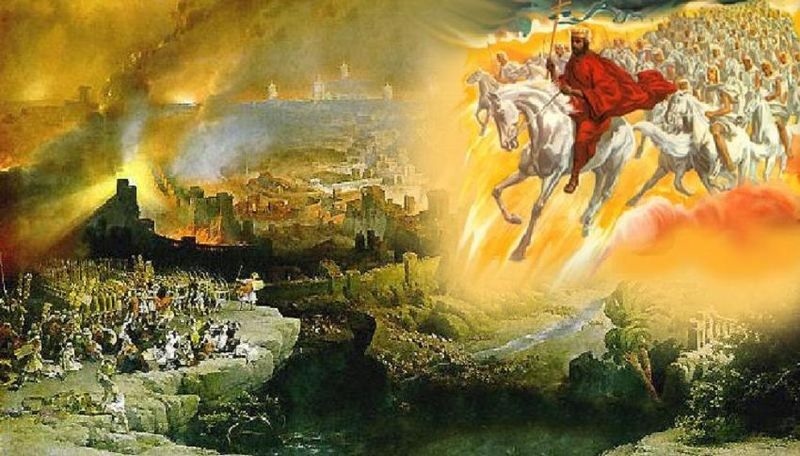 Preterism, Preterist Interpretation, and the Preterist View of Eschatology: Near-Death Experiences suggest that the New Jerusalem exists right now. NDE descriptions of heaven resemble the New Jerusalem. 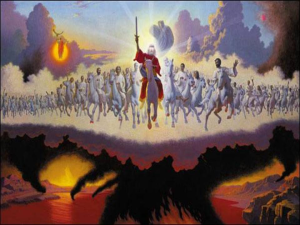 Preterism, Preterist Interpretation, and the Preterist View of Eschatology: The Messianic Kingdom is called the Kingdom of Heaven because it is centered in Heaven. What about the Messianic Kingdom? As stated above Hebrews 12:22 and Galatians 4:26 reveals that there is a Jerusalem that is in heaven. It is there in the heavenly Jerusalem that Jesus, the Messiah, rules at the right hand of the Father. See The Miraculous Fulfillment of Jeremiah 33:20-21 explains why Christ Rules from a Heavenly, Not Earthly, Throne. Preterism, Preterist Interpretation, and the Preterist View of Eschatology: What About the Resurrection? If Jesus rules in heaven, then what about the resurrection? See The Notion that the Resurrection is an Earthly Phenomenon whereby the Dead are raised as Perfected, Eternal Earthly Bodies is dispelled by 1 Corinthians 15:35-50 and Isaiah 65:20, 1 Corinthians 15:50-54 and 1 Thessalonians 4:13-18: Preterism, the Rapture and the Resurrection and How the Resurrection Bodies of the Saints Perfectly Mirror Jesus’ Resurrection Body after His Ascension Into Heaven Fulfilling Philippians 3:20-21 and ALL Other Bible Verses on the Resurrection!!!. Preterism, Preterist Interpretation, and the Preterist View of Eschatology: Don’t believe the Critics. This website will show how critics of preterism, preterist theology and the preterist view of eschatology reveal their ignorance of Biblical exegesis and Roman history by their arguments. This website will highlight and explain the fulfillment of seemingly ALL end time Bible prophecies with historical events recorded by Roman historians often down to the tiniest details. Interested in PRETERISM, PRETERIST THEOLOGY or THE PRETERIST VIEW OF ESCHATOLOGY, or are you a PRETERIST struggling with a prophecy or verse? It DID happen just like the Bible says! If you liked this essay, see PRETERIST BIBLE COMMENTARY for a detailed explanation of the FULFILLMENT OF ALL MAJOR END TIME PROPHECIES IN THE BIBLE. The more unbelievable the prophecy, the more amazing and miraculous the fulfillment! For an explanation of how the end of the age and its fulfillment during the Jewish War mirror Genesis 1-3; how the Bible teaches that the resurrection of the dead is a resurrection of heavenly bodies to heaven, not a resurrection of perfected earthly bodies; and how the resurrection is a mirror opposite of the fall see How the Jewish War and Resurrection to Heaven Mirror Genesis and the Fall; and How Preterism fixes the Age of the Earth Problem and unravels the Mysteries in Genesis. [i] Josephus The Wars of the Jews 6.5.3. 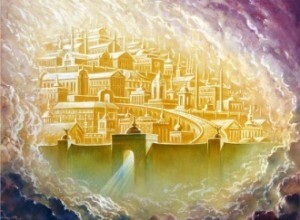 [iii] In Revelation 21:2, the new Jerusalem is seen coming down from heaven. What could this mean? See Revelation 21: A Preterist Commentary and The Biblical Solution to the Predestination Paradox. [v] Don Piper and Cecil Murphey, 90 Minutes in Heaven: A True Story of Death and Life (Grand Rapids: Revell, 2004), 34-35. Preterism, preterist theology, the preterist interpretation of the Bible and the preterist view of eschatology is the Christian belief that Jesus has already returned and that most, if not all, end time prophecies have been fulfilled. I do not BELIEVE that the scene portrayed in the clouds in 66 Ad is that of the SECOND COMING of the LORD JESUS CHRIST. I do BELIEVE, however, that it depicts GOD’S JUDGEMENT …METAPHORICALLY. I do believe that the CHURCH is waiting patiently for this remarkable event, which will SHORTLY COME TO PASS… ie, THE CATCHING UP AND TAKING AWAY OF BELIEVERS. THIS IS WHEN I BELIEVE THE SECOND COMING WILL OCCUR. BELIEVERS who make up the CHURCH which is THE BODY OF CHRIST including myself are all waiting patiently. GOD BLESS. SINCERELY… KENNETH.